﻿ СВЕТОГЛАС - нов албум "Моление Господне"
СВЕТОГЛАС - нов албум "Моление Господне"
\"Вяра и общество\" за новият компакдиск \"Моление Господне\"на вокална формация \"Светоглас\". 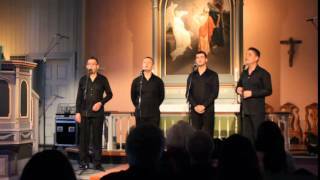 Male acappella vocal quartet gives deep depiction of the ancient Bulgarian folklore, and polyphonic works of Orthodox sacred music. They explore and introduce the ancient hymns, unknown until now. These are the masterpieces of Bulgarian monophonic music and its manifestations during the centuries. Members: Daniel Spassov, Stanimir Ivanov, Viktor Tomanov and Milen Ivanov.